I usually don’t answer such messages on Facebook. I also don’t take such messages seriously, but I was curious and I was in that mood, where I said myself, let’s see what kind of nonsense will this guy try to sell me. Why nonsense? Because there is no such a thing as a “3–0 tonight” or “guaranteed bets”, if you like. Anyone with little bit knowledge about sports betting knows, that the odds are simply probabilities turned into the odds and if there is one event, that has 100% of chance, bookmakers would never ever offer such a bet. So, talking about 3–0 night or guaranteed things in sports betting is little bit crazy. But this is a topic for another time…. By the way, the guy went 2–1 that day, but this is not important, because the worst handicapper can go 8–0 and the best handicapper can go 0–8 on any day. Of course, we can also discuss about the average odds and the probabilities here, but if we stick with -110 odds, this can and will happen on the long run to anyone. I started laughing and asked him to send me detailed results in a sheet, so I can check it. Of course he didn’t have. He closed his account right after our conversation. But after that, his friend started conversation with me. For me they looked like a team. He was very friendly and he said, that they are top betting service in Las Vegas, who work with top clients. I spent exactly 56 minutes and he didn’t show me any results. He said, that he will show me results if I come to his office in Vegas and if I pay. Why should I pay for past results?? if I want to buy a Mercedes today, I want to know how fast it is, right? What is the problem with past results? I understand, that if you sell picks, that you will not show me future picks. That is totally ok. But why you don’t show past results? Last 1000 picks at least if you claim, that you have clients, that bet $20.000 per bet? To build a business, where you sell one advice for $1000 or something like that, I expect detailed results with yield, detailed risks, odds, bookmakers, etc for at least 5000 picks from last 5–10 years. But of course, the guy didn’t have any results and this is how I realised, that most of those services make money with the SERVICE, not actual BETTING. And believe me, they are making huge money. So, how is this possible, that there are people, that will buy a Mercedes without knowing how fast it is? And what are the things, that betting services know and don’t want that foolish people will ever understand. I am from Europe and I am amazed how good are American handicappers with hiding the results. If you go to a random betting site from Europe, there is a big chance, that they will have detailed results with the yield, ROI, odds ad everything else, but if you go to random betting site in USA, they will hide most details. In best cases you get “W-L record” and “profit” for current season, which is nothing. Nothing. I was talking with couple of US handicappers and most of them are very friendly. But when it comes to past results, I hardly find any US handicapper, that sell picks, that has detailed past results (yield, ROI, avg odds, risks compared to bankroll, bookmakers,…), which can he send you right away in csv file. Most of them jump from betting site to betting site, where they share their picks and when they change 10 different betting/monitoring sites, of course they will win somewhere. But we are not talking about how to win at competition, but about last 1000 picks in a csv file, so you can calculate for yourself what is ROI, yield, what was money management,…. And then decide if it is worth to pay for the pick. I am also surprised, that monitoring sites don’t calculate yield, bookmakers info, starting bankroll,…. For me the record of 240–215, +32.15 is nothing. To make final conclusion before you pay for the picks, you need more information. The odds are the key for sports betting, right? If you make a play or not, the odds will decide. I hope you agree with me. It’s not about who will win, but about the right price or the value if you like. In other words, if you think, that one game is 50–50 and the bookmakers will offer the odds of +130, you will play this team. if they will offer -130, you will not play this team. Right? So, what most betting services will not tell you is the line movement, that will happen for sure. If you bet online, you know, that if you bet little bit bigger amount of money, the line will move. And now imagine if you have 100 clients and if they all bet $1000. And you are 87th who will place the bet. What do you think will be your price? Do you think, that the price is not important? Price is the key and you will get lower price on good bets in most cases. If you bet online, bookmakers have their limits and they will not let you to beat them. Most of them. So, if you pay for one pick $25, how much starting money you need to have and how to take this into account? If you bet $100 on a game, you need to have around $5.000-$10.000 of starting bankroll. Betting small amount of your bankroll is important and this is a topic for next time. Online bookmakers will allow you to bet usually not more than $5000 (Bovada, 5Dimes,…) per bet. Usually $1000 and if you beat them constantly you will get into the trouble. But to bet $1000 per game, you need around $50.000 — $100.000 to invest properly. If you bet $100 on a game and if you pay $25 for one pick (this price I see all over the internet), which is small compared to prices in Vegas, your odds are lowered. And here is how. Bet $100 on the odds of +100 and if you win, you make profit of $100. Right? When you take into account, that you paid for the advice $25, then you basically made only $75 of profit. That means, that you risk $100 and you won only $75. What if we turn this into the odds? What are the odds, when you win $75 by risking $100? -133. So you basically don’t bet $100 on a game with the odds of +100, but -133. And the results? 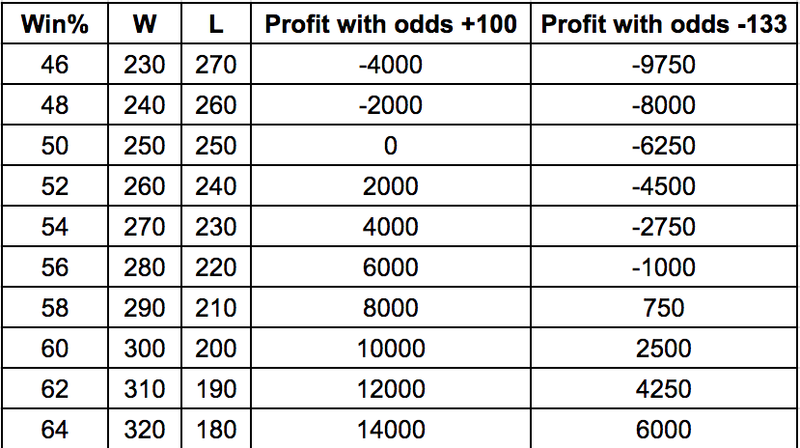 As you see, betting service can claim, that they make +6000 units of profit with win% of 56 (this is almost not possible on odds of +100 on the long run, but is good for our example) and at the same time, you will make a loss, because you take into account the cost of the service. When you take into account the results and the cost of the service, betting services usually can not reach such a winning percentage. This is also one of the reasons, why they hide or don’t show complete results (with yield for example). This is also one of the reasons, why most betting sites, monitoring sites hide all the details about picks. “W-L” record and “Profit in Units” is flawless. Simply as that. They all claim, that they are number one in country. Betting competitions are not realistic. With competitions you don’t need to deal with bookmakers limits, with dropping odds right away, with your own discipline, etc…. And in most cases you have unlimited bankroll and you can leave when you want. In real life if you work couple of months for your bankroll, this is not a joke and this is definitely not a unlimited bankroll. So, the things are quite different, right? Betting competitions are not realistic. Simply as that. Betting gurus does not exist. Sports betting is a game of numbers. It is a game of analytics. If you are smart enough and you have some math background with combination of love for the sport, you can succeed. If not, you will probably lose. You are not born with “betting skill”. Things are changing quickly, bookmakers are smarter and smarter and if you won a competition in 1997 and you are not willing to learn new things, you are out. Intuition and experience are nice. But they should be taken together with facts. And analytics is all about that. Either you are smart and work hard, either you lose. Don’t buy “guru” stories in 2017, be smart. Sports betting is not easy. To beat bookmakers today you must use analytics to find the edge, you must play on bookmakers, that will accept your bets, you must have strong money management, you must be very disciplined,…. and even if you are successful with all those things, there is a chance that you will not make money at some point. But if you sell picks, you need only two things: A lot of foolish people + good marketing. Why bother with statistical analysis if you can make much more money selling picks. I can guarantee you — most betting services make most money with selling picks, not with actual betting on sports. A lot of them don’t even bet. This was confirmed to me personally from someone, who runs successful sports betting service in USA.